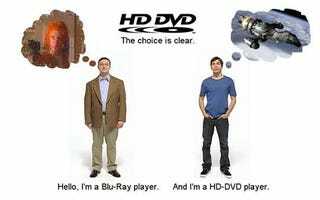 A Rant Against Blu-ray vs. HD DVD: Which Hurts The Consumer More? Wayde Robson of Gizmo Cafe may not know whether Blu-ray or HD DVD is better, but he does think that Blu-ray wasn't made with the consumer in mind. Wayde goes on a rant, claiming Sony lured in more support from the studios because they made their format more studio-friendly in terms of DRM and content protection. Then he says Sony really doesn't have the consumer in mind, being that they're both a media and a content company. Actions like introducing BD+ (an extra layer of protection) in order to get a studio on board and not adding managed copy (backing up your Blu-ray disc) only when HP promised to pull out don't do much to put Sony in a good light. He makes no claims that HD DVD is better, just that if Sony wins the format war, things may get ugly for the rest of us not wearing thousand dollar suits.